Artistic Director Anita Menon says her motivation for doing these grand dance extravaganzas with Western themes is to keep Indian Classical Dance relevant to kids of today and I think she succeeded in spades with this show. What surprised me though was to see Shakespeare actually enhanced by the hand gestures, eye movements, facial expressions and other typical elements of Bharatanatyam. I think the Anjali School is on to something here! Shakespeare can be a bit heavy, but when mischievous Puck (played by Alisha Menon – also a student of the Northwest Children’s Theater) rendered his soliloquy I suspect it was a lot easier for most of the audience to understand and relate to, without taking a class first. The fairy king and queen – Oberon and Titania, Bottom, Hermia, Lysander and the other characters all came to life in an unusual new way, quite an achievement by the performers given that they must have had to switch from dance to theater mode constantly. Now Anita Menon of the Anjali School of Dance has adapted it using Bharatanatyam, a 2,000 year old dance form from India, as well as ballet and Bollywood, hip-hop and tap. The story has been served up in dance before, but perhaps never with this sort of, shall we say, seasoning. 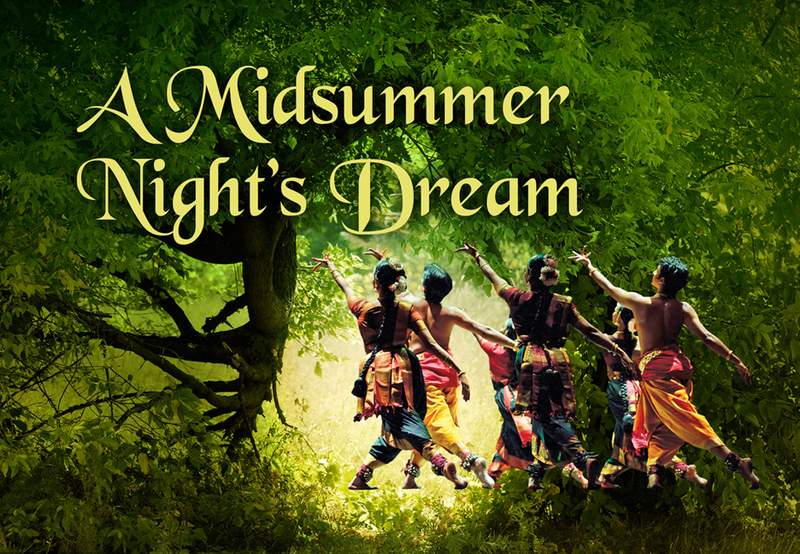 But honors for the most original interpretation of the Bard for the 2012 season probably go to the Anjali School of Dance, which in September performs A Midsummer Night’s Dream using the traditional, 200-year-old Indian dance form of bharatanatyam. Anita Menon, the school’s founder and artistic director, says she wanted to tell stories that would resonate more with her young dancers, who all studied A Midsummer Night’s Dream in sixth grade. I had worked so hard for this day. Practicing a dance, learning a new song and even preparing a Shakespearean monologue, which I had never done before. My dad and I spent days finding the perfect monologue for my audition. After lots of searching I found a monologue from Midsummer Nights Dream itself. It was my first time reading Shakespeare and I thought it was very weird and didn’t understand it at all. Then my dad explained what it meant and I understood it. The audition process was easier than I thought. I was not nervous when I saw that my friends could do it and that Anita was so nice. Then I decided to just go for it and it was super fun. I now know I can do auditions anytime. It was the grand finale rehearsal! I Finally got to meet the whole cast of the play; the fairies, mechanicals , lovers and more. I was so excited to finally meet all the I would be working with the next couple months, But not every face was a new one because I had already met all the other big fairies and Alisha who plays Puck. When I first got there Anita was there along with the other girls. The little girls were the first ones to learn their part. Anita asked Sarina and I to assist them so that they wouldn’t get lost when going to their formation, but we quickly realized that Sarina ended up on the wrong side so Ciara did it instead. After that it was our turn to learn our part. It was fun because we got to dance with sticks. We only got one stick for rehearsal but I think we will get two for the performance. At first I felt a bit lost because I had never done a dance with sticks but as soon as the music turned on and we did it up to tempo I felt like I had known this dance for a year. After we nailed the first part Anita brought everyone one the dance floor to learn a really hard move. I want to tell you what I felt, but honestly I didn’t have time for feelings. I had to only use my mind for focus. It was so hard that not even the most advanced crew could so it. Soon when we did it in a circle I realized that all it is a step turn. Then it wasn’t as hard because I knew what a step turn was. Soon the night was over and it looked great all together! I thought I had done all styles of dance when Anita told me I would be doing a Dandia and a folk dance.I had never done anything even close to this style. I like how the moves are so different from all the other styles I had learned before. It was also interesting that there were many repeating patterns in the dance. I also loved the partnering and doing things in groups. There is one part where we go in a tricky formation and we all needed to work together to make it look right. There are also so many parts where we are wacking sticks around so we need to be aware of each other!!! All in all, I am learning that while dance styles seem very different on the surface, one you get into it dance is very similar no matter what country it came from. I guess dance really is a universal language. I had a great time at the Polaris Dance Galaxy festival yesterday! We got to perform our ballet dance with Titania and all the fairies. We also got to watch other performances and I even learned a spanish folk dance with my friend and fellow fairy Ciara and my mom learned to salsa dance! I also saw a lot of people that I knew like my ballet teacher Miss Allison and some kids from a dance camp I took this summer. Although it was fun there were also so scary parts like when there was an accident on the highway so some of the kids didn’t get there until about 5 minutes until we performed!!! There was also one part when I messed up and sat down to early. Overall, I had a great time! It is so great to be part of such a supportive dance community and share my love of dance with everyone there. On Thursday we had to re-choreograph the Tap/Baratanatyam number. It is interesting because while we had worked on it before, once Anita aunty saw the whole show and how it flowed together she decided to make it different and put it in a different spot and called it Titania’s entrance. We divided the dance into 4 sections. It was super fun because one of the other faries (who wasn’t in this dance) got to play the drums so it was live music. We changed section 1 so that we could travel into a pyramid. Section 2 traveled even more forward but the steps were different. Section 3 was the easiest to do and Section 4 was the hardest, but we came up with an awesome ending pose! Overall this dance needs lots of work but I learned that it is much easier to tackle complex things if you break it up into parts! In practice last week we did a whole show run through. It was really fun because the whole cast was there and I got to see every single dance (the duke and duchess weren’t there so some dances were empty) and everybody got to see mine. I was really excited to see how the whole show works. It was very fun because as I was watching and I could see how it tied in with the original story. My favorite dance was called “love confusion” (which there is a lot of in A Midsummer Nights Dream) it is about when Lysander and Demetrius are both under a spell and they both are in love with Helena all because sneaky Puck put a love potion on them. My favorite part was when they have a sword fight over Helena. Its so intense that you totally forget that the swords are plastic and no one will die. It is also great because the fight is choreographed so it still is dance and they managed to add some steps. I liked all the scenes and I am excited to see how the real show turns out!! So this week we mainly focused on running through the show. It was very hard because Shaila (Titania) left this week to go to college. She was in so many scenes! Amita filled in for her in most, I bet it was kind of hard to learn that many scenes in such short time. Shaila had to run through other’s normal rehearsal while she did dress rehearsal because she wouldn’t be here for our dress rehearsal. That was the first time I got to see some of the costumes. My favorite costume was the opening number costume it was really pretty. We also got a poster that said when we need to change, what to change into, who’s helping us and how much time we have to change. I have 4 different costumes to change into, my dear costume, my fairy costume, my village dance costume and my wedding prep costume. Thanks to Alisha for making the poster! Oh thanks to Anita Menon for being there on Friday even thought she had a headache! The think the play will be great!! Being an avid reader and lover of English literature, I have always enjoyed reading Shakespeare plays and have acted in several of them in school and college; although never in a dance production. When I first heard about AMND and Anitas invitation to different dance schools, I thought this was a great opportunity for my students- and me. When I asked Anita if teachers could audition, she was very welcoming. The audition process and expectations were made clear in the initial emails, so there were no surprises. I was impressed with the manner in which scheduling was done for practice sessions, keeping in mind the different requirements of 40 dancers. Excited all day long for the first session , and very curious about the music, choreography and whom I would be dancing with. Met with a lovely young dancer Kamya who plays Hermia. Anita gave us an overview of the scene, and the music was absolutely perfect for what she wanted to portray. Even though I had never worked with Anita or her students before, I felt very comfortable and part of the group. Anita has a very clear precise way of explaining what she is looking for, and how she has visualized each character. As we progressed through the sessions, Anita added to and improvised the choreography, trying to bring out our strengths and make our characters more real. I especially liked what Anita was telling some of the other dancers today ‘read the play, look at ballets and other videos of the story and try to incorporate a particular characteristic of the person you are playing.’ Although I am a traditionalist at heart, this production was too tempting for me to pass up. Not only was I going to enact Shakespeare through Indian classical dancing for the first time, but this also gives me an opportunity to look at and learn from a different teaching style, how another dance school/teacher works, how to ‘Indianize’ a story set in an entirely different country and culture, and most importantly, this gives me an opportunity to be a student yet again. It is just our third week into practice and already so much has happened! The thillana is complete and looking good. We started working on the opening dance as well as the intermission dance. The music for the intermission dance is awesome. Hermia and Egius (your truly) have their work cut out, it is an emotional scene where the characters need to connect. Next week we are working on the forest scene, again waiting to see what Anita has planned. The practice sessions are so much fun,and we have two sentinels watching our every move (Soumini and Meera) which will make a huge difference in our performance. Lots of discussion on costumes this week,and I finally got my peacock feathers yay! The schedule is getting more and more full with practices but there is so much to do. Anita is handling the demands of the production superbly. Being a teacher myself,I understand the workload and multi-tasking involved. Looking forward to the weeks ahead. Week four and here’s more! This week, we got quite a bit accomplished. The forest scene, intermission and opening dances are all done. It will be interesting to see how everything fits next week when Anita gets the scenes together. The anchor team is a delight to work with, enthusiastic teenagers who are working very hard and are so much fun. I also got a sneak preview of some of the other scenes, the dance between Oberon and Puck is beautiful, very well done. There is great chemistry between the two characters. Alisha is a seasoned performer with no inhibitions and that’s perfect for Puck, she is a natural. Like her mother, she is ready to try out suggestions from other dancers and changes things to suit her role even though her original ideas might be entirely different. Time is passing by really fast with all the practice sessions, I will miss being part of this team once AMND is done. Adios and see you next week! This week we had run throughs of the full program and we got to see how much time we had to change costumes. I did not realize how fast time has flown by with so much going on. Stitching on the costumes is going to start soon, our opening dance costume colors are lovely. I got to see the fairy dance and it looks great. They were probably the best prepared group this week – lots of credit to the little ones. Adieu till next week. This week was a rest week for me. It really helped since I did the bridgepedal event on Sunday , so it was nice to have a break. Met with Anita Mahendra and had a great time deciding costumes. Anita gave me some very good tips on hair and helped me work out the peacock costume, I think I’m all set! Happened to hear the music for the fight scene, its great. The fairy showcase video looked awesome, loved Shailas costume. Hope to see everyone on Sunday (India Day). I am performing a ghoomar dance with some lovely ladies at 6:30 pm. Looking forward to rehearsals next week. Working with Shaila this week was a lot of fun and very useful. Shaila is so detail oriented and was very accommodating in meeting with me and going through the dances several times. Scheduling the full rehearsal was a good plan this week, there were many points that came up in each scene with we still have to fine tune. But the play is coming together and all the characters are getting more comfortable in their roles. This week was truly exciting. We rehearsed every evening and worked on the full show several times. Every scene is looking great. There is not a dull moment in the entire show. This can be attributed only to Anita’s fantastic choreography and music selection. I also got to learn from the organizing skills of Anita’s team. Anita Ramachandran is doing an amazing job with costumes, keeping track of orders, measurements, working individually with each cast member and patiently answering the same questions over and over again! Sowmini has taken over rehearsals and she is cool and collected, and so easy to work with. Meera Kanagal has a special talent of bonding with the younger members of the team and again helps to keep the entire cast on track in a calm way. A lot of work has also been put into organizing helpers for each participant backstage and they have minimized the number of volunteers, which I think really reduces chaos. My particular scene is finally falling into place. When we first started it seemed simple, but as we kept working on it, there were so many little details that came up. It has been a delight working with Kamya . I also heard many of the cast members say that they are waiting for Anita’s next production and they want to come back. And yes, this definitely includes me too! Finally, the day we were all waiting for – Sept 8th! We got to the theatre well ahead and everyone was ready , high with excitement. Anita came and spoke to us before the show started and gave us a good pep talk. All the cast members looked wonderful in their outfits and so ready . Once we got done with the opening dance, I ran back in to change into Egius. Since we had done costume rehearsals the week before, everything went smoothly. After Egius, the peacock costume was more elaborate and we had to remember to get all the pieces on. The backstage organization (Anita Ramachandran) and group were exceptional. All the volunteers were so helpful with anything that the participants required. My special thanks to Rashmi, Chandrika, Anu for helping me with my numerous costume changes. When I stepped onto the stage in the peacock outfit along with the snake and deer , I could almost hear the audience exclaim in surprise and pleasure and my immediate thought was ‘this was a great idea of Anita, to have animals in the forest scene. ‘ the intermission dance was the most exciting of all, the music sounded great and the group danced with full energy. During the second half, I got to relax for some time, and watch part of the show. Every scene was great, and all actors did a wonderful job. we all held our breath in the side wings when the Bangra group had to hold the final pose, but they did it with so much ease, it was fantastic. One of my duties was to help the little faries with their dress change, but they were so prepared, they really did not need much help at all. The breathless few minutes were getting Poorna out of the Oberon costume and into the Thillana outfit, then both of us running across to the other side of the stage and making it just on time when the music started. The adrenalin rush was exhilarating. At the end of the first show, we were all happy, and eating donuts thoughtfully brought by Meera Kanagal. The second show was a breeze, I did not notice the time go by at all. When it was over, and I was sitting in the car, being driven home by my husband and son, the events of the past few months just by in my minds eye, starting from the first email that Anit sent, and my tentative question ‘ are teachers allowed to participate ‘ , her encouraging reply , the auditions, first practice , meeting the teenagers who formed the anchor group, the excitement of the last weeks rehearsals with costumes and on stage and getting pictures with my fellow dancers after the show. I turned to my husband and said ‘ I wonder what Anita is going to do next year…’ After the show and lessons learnt The compliments I got after the show were numerous. The most common phrase was ‘the costumes were fantastic, who designed them?’ Puck was the most admired character and rightly so. One of the many things that were great about this show, was the casting. Every character had the right person doing that role. The choreography was kept simple and very clear . I think this was especially helpful a main part of the audience who had no knowledge or experience with Indian classical dancing. music selection was of course, wonderful. weaving in Shakespeare into the play was a stroke of genius. what a simple yet effective way to let everyone know what’s going on. Anita also kept whole play very authentic and she picked out little nuances, points in the elaborate dialogues and had them enacted. one scene where some friends were a little confused was the Bhangra (though I personally feel it was very clear with Scott coming out and shouting ‘let’s get back to the story’ . The organization was excellent all throughout. Starting from scheduling, to costume coordination, Shaila keeping people on track with emails, Sowmini calling the next set of dancers backstage in a calm manner, and all the volunteers knowing what they we supposed to do. There was no confusion at all. This was so professionally done, there is a lot to learn. I hope that Anita does many more productions in future and I would love to be a part of her programs , time and schedule permitting. I will miss the anchor group,such a lively team and talented youngsters. God bless and good luck, cast and crew of AMND. I met Anita in the Purandharadasa Program in Feb 2012. I was very impressed by her innovation concepts and themes in her production. I am an avid reader and have performed Shakespeare Macbeth, Comedy of Errors and the Twelfth Night in school dramas and plays. When she approached me if I was interested to audition for a Mid-Summer’s night’s dream, I thought this was a great opportunity. Anita was very welcoming at the auditions and made me feel at home. As a new dancer in town, Anita was very encouraging and opened a lot of avenues and ideas for exploring dance here. Working with Anita has been a lot of fun. She is very organized, extremely dedicated and very passionate about inculcating about new ideas and concepts. She creates a visualization of your character and pushes you to develop the character. In every step she gives more suggestions, broadens your thoughts and brings you to portray that character. And I enjoy dancing with Shaila, Alisha & Sanya. They help me bring out my character better! Groomed as a traditional classical dancer, A Mid-Summer’s Night’s dream opens to a new picture of me! I am very happy to be a part of this production and I look forward to all the new challenges! Some bleary eyed, some sleepy & some bright, we were up and awake at 7:00 am for practice for Thillana on Saturday. Those two hours were hard hitting practice session but it felt so great to have a work out so early that morning. The energy that bounced from 10 dances practicing hard over and over again was amazing! Made my day being extremely active and I ended up hiking triple falls that day! My next practice was withAlisha, the introduction of Puck and Oberon. Young, versatile and supple, Alisha also has a charm in her dance through her expressions. She got me in splits that day with her all her ‘goshte’ (mischievous acts) expressions as her mother puts in! When I was thinking how to portray a Shakespeare character, Anita helped understand by bringing out resemblance of Krishna for Puck. We also had a finale practice that day and an introduction round of the dancers present. Group practices are more challenging as it requires perfection from every dancer together! That’s what makes it hard, challenging but the end coordination on the dance and positions will be worth the hard work! This was one of the challenges faced this week. Looking forward to practice sessions that are yet to come! Third week and counting! The rehearsals are in full swing and they are back to back! Continuous practice of every scene from the ‘top-top’ in Anita’s words! AMSD is helping me learn a new culture and what better way to learn it than bringing out resemblances with our own Culture. I was truly amazed when Anita explained Oberon’s Character with Puck, where he asks Puck to go fetch a flower similar to how Rama asks Hanuman to fetch Sanjivani, a herb to cure Lakshmana. In each practice session that I attend, I understand how much of a co-incidences are there. It is truly a feat to teach & learn our traditional dance to the stories of the west. Looking forward to the next few practice sessions-Oberon’s anger, the confusion & the main plot of the whole play! Short yet interesting practice this week! This week, my practice session was very short. Only an hour in the whole week, yet I felt this was one of best practice sessions. We did the pre-interval dance and I enjoy this dance. Maybe my favorite so far?.. hmm confused. I like Oberon-Puck intro and TOPC as well! Pre-interval dance: the music is simply superb! its make us all dance to its tunes with joy and our co-ordination for this dance is pretty fantastic! It was fun to listen to different suggestions on the formations- the postures to make the dance look good and Anita says,’Poorna, you’ll have a lot of jumping in this one’! especially to hold out the posture and make the jump in that fraction of a second coordinating with the music is a main task! It was a lot of fun! The more challenging it gets the more I like it! Maybe that’s why Pre-interval has a slight (teeny weeny) edge of favoritism over the others! Ciao! I look forward to next week to meet the whole cast, dancing this time!! This week’s practice was the most interesting of the whole. For starter’s we got to see the sequence of AMSD (it was just great to see the whole cast, dancing this time!) and secondly, I probably did my best step so far in the production. Monday’s practice brought me in the second half, the much awaited plot of the whole AMSD. When Anita explained the sequence to me, I got so confused! The ‘Love mix up’ is truly a mix up indeed!! But it was much fun. Esp to see Meera (Helena) shower her ardent love to Demetrius. Got us reminisce all the Saroja Devi/Gemini Ganeshan movies to come up with ideas! Following that, on Tuesday, we got to see the sequence of the first half of AMSD. Before this, Anita & I were working on a fight sequence deciding on steps to portray Oberon’s anger. I remember the words my teacher told me ‘Sometimes more than expressions, aggressive steps depicts the anger more’. With that in mind, I tried to rotate around the floor on my knees and I was pretty amazed I succeeded. This was a step I had done last about seven years ago, a long time indeed! So that went well and after this, full practice session started. I enjoyed the Beethoven’s fifth symphony, Titania’s entry and Running through the forest scene the most. The ballet dancers dancing to classical music with Titania and other fairies was truly beautiful to see! For running through the forest, Anita said to Alisha, people enjoy seeing you get hit the most We did enjoy it that the most. ( ;)) Mostly as Alisha and Ellyse expressions and chemistry was too good! The TOPC fight came out better than all our practice sessions! We truly fought for Changeling boy like never before. Truly a joy to get into the character and bring out the best in each other. I was really looking forward to see the sequence of AMSD’s second half particularly the love mix & confusion but to my dismay I fell ill and had to miss the practice. Truly bummed, then again there’s next week to look forward again! Ciao! Three weeks to go for the program! This week the final choreography for my part was done. The entire plot, the mix up and straightening of the confusion was completed! Discussions were made on my costumes, dress change and the things for the day of the program. I enjoyed learning & dancing with Puck & my Fairy Queen, The chemistry has worked out well and all we need now is more & more practice. I am looking forward to see the full sequence of the show. The countdown has begun! The countdown has begun. This week we had a run through of the whole show and wow, did we have some major correction-session. We had practice for about 2 hours and a correction session which lasted for almost an hour. I felt the correction session helped a lot. Though we are practicing home individually, when it comes to group co-ordination is most important and that was our focus for the practice session this week. Certain tips/corrections which Anita gave really helped a lot. Now it’s up to us to perfect it. There were also discussions on the costumes, hairdo, and time change for costumes. With all these discussions, it seemed yesterday; I met Anita &had auditioned. Time has indeed flown. The next two weeks is only practice and perfection. The excitement for the big day has crept in! Ah! This might be my last blog post and when I think of it, I am partly torn with the program excitement creeping in and partly I have a twinge of sadness that all rehearsal sessions and all the fun is coming close to an end. This week’s practice was definitely the best so far. The story has woven very neatly and everyone has groomed in their roles so well, that it’s hard to imagine anyone else do the part. I finally met the duchess and was impressed that in a short span of two days she picked her role so well! I particularly enjoyed the Ballet dancers dance to classical beats and the classical dancers to the Beethoven’s fifth symphony. Truly a joy to witness it. All in all, every scene, every role is done with complete interest and dedication. I would like to thank Anita Menon for this wonderful opportunity. Like I had mentioned before, this is my first trip to the US and I cannot ask for a better summer than this, to experience the joy of dancing in such an innovative production. I would also like to thank Mini, Meera and all the dancers for their co-operation, all the fun times at practices and for making me feel at home! Good Luck to everybody lets rock the show!! I sit to pen down my blog post the program. It has been a week since the show yet the post-program excitement is still sinking in. Let me start by congratulating Anita, the entire cast of AMSD, the wonderful coordinators of the show and the most supportive parents and husbands! This was a team effort, without this team effort, the show would not be a success. We have got a fantastic review on Oregon arts watch and I hope there are many more to come! We had a dress/stage rehearsal on Fri, the eve of the show. This helped us get familiar with the stage, the ambience and understand the timing for dress change. I had to change from a male character to a female character in 6mts and boy, was that a task! Saturday arrives before even I know it. I was up all early in the morning, geared up for a great day of dancing. I was all ready by 11:30 and since Newmark was only five mts away from home, I dressed with ease and comfort. Anita Ramachandran was wonderful in helping me add the final touches to get ready as Oberon. Our first show was at 2:00 and we had a circle time, this was going to be the last two times we danced together on this show. It was a small emotional moment for me as well. The ten weeks of hard work was finally going to be staged! I performed both shows with dedication and enjoyment!! For someone who has danced for almost 15 years on stages, this opportunity to dance in one of the best stages in Portland was a wonderful feeling, something which goes beyond what I can express in words. I thoroughly witnessed every scene with joy that day. I felt everyone was at their best, everyone was in their character & displayed their best effort and most importantly, I felt everyone was enjoying themselves! I particularly enjoyed the theater in the dance. I have always been fond of theater. Back home, I had even participated in a lot of them. To see that combined with dance was something I enjoyed a lot! It was also a treat to see Alisha’s ‘Call me maybe’ after the show. I’ve seen the song a number of times; but I enjoyed it the most that day. Maybe it was a recap of all the dedication and all the fun we had over the ten weeks that it was such a wonderful touching finish to the audience and to the people who worked on AMSD as well! It has truly been a pleasure to work with Anita and the team of Anjali School of Dance and all the other dancers as well. Dancing in this production has broadened my vision to learn and teach this glorious art. Dance to me is more than a passion; it’s an integral part of my life. I hope there more opportunities for future performances with Anjali School of dance and that Anita & I are able to collaborate on projects which are of mutual value to us. To Anita and the entire team, thank you for making my first summer, a joyous experience! Nulla odio ante, rhoncus eu feugiat id, commodo a odio. Donec rhoncus urna nec magna congue molestie. Sed ut perspiciatis unde omnis iste natus error sit voluptatem accusantium doloremque laudantium, totam rem aperiam, eaque ipsa quae ab illo inventore veritatis. Nulla bibendum diam nec tortor ullamcorper sed dapibus sem posuere. Donec nunc sem, consequat ut gravida et, mollis interdum sit auguemollis viverra leo, quis rhoncus magna fringilla eget. Phasellus ut ornare orci. Fusce tempor, neque pretium vulputate vehicula, ligula odio convallis mauris, laoreet vehicula dolor odio nec augue. Donec fringilla nisi eget felis sollicitudin pulvinar. Quisque et lorem vel libero elementum eleifend eget vitae tortor. Sed blandit pellentesque tellus vel dignissim.